This article is about the section of Interstate 95 in Maryland. For the entire route, see Interstate 95. Interstate 95 (I-95) in Maryland is a major highway that runs 109.01 miles (175.43 km) diagonally from northeast to southwest, from Maryland's border with Delaware, to the Woodrow Wilson Bridge, briefly entering the District of Columbia before reaching Virginia. The route is one of the most heavily traveled Interstate Highways in Maryland, especially between Baltimore and Washington, D.C., despite alternate routes along the corridor, such as the Baltimore-Washington Parkway, U.S. Route 1 (US 1), and US 29. Portions of the highway are tolled. Between the Baltimore city line and the Delaware state line, I-95 is known as the John F. Kennedy Memorial Highway. Interstate 95 enters the state of Maryland concurrent with Interstate 495, the Capital Beltway. From Alexandria, Virginia, the roadways, five lanes in either direction, travel together over the Woodrow Wilson Memorial Bridge, briefly cross the southern tip of the District of Columbia (over water), and touch down in Prince George's County west of Forest Heights. I-95/I-495 immediately encounter the southern terminus of Interstate 295, known as the Anacostia Freeway, a route that serves downtown Washington, D.C. and connects to the originally planned alignment of I-95 through D.C., Interstate 395. Just beyond I-295 the two routes interchange with MD 210, a major north–south route into southern D.C. The two Interstates continue along the Capital Beltway, interchanging with various local highways such as MD 5 (Branch Avenue) and MD 4 (Pennsylvania Avenue) on either side of Andrews Air Force Base, which the Beltway travels very close to near its northern edge. Turning north past the MD 4 interchange, the Beltway runs through Glenarden, interchanging with MD 202, US 50/secret Interstate 595, and MD 450, the latter route offering access to the New Carrollton metro station and the New Carrollton area. Turning northwest the Beltway enters Greenbelt Park, intersecting the Baltimore-Washington Parkway in the northeastern edge of the park. Just after the B-W Parkway the two routes interchange with MD 201, which connects to the southern terminus of the B-W Parkway at US 50 (New York Avenue) near the D.C. line. Now turned fully west, the Beltway runs through the northern edge of College Park, interchanging with the Greenbelt metro station's access roadway and US 1. Beyond the US 1 interchange, I-95 encounters its own route at the College Park Interchange, and separates from I-495 within this interchange. I-495 continues west, alone, on the Capital Beltway to Interstate 270, while I-95 turns north onto its own planned alignment. The interchange includes access to a Park and Ride. Running northeast, I-95, still eight lanes wide, passes through Beltsville, interchanging with MD 212 near the community. The highway, completed in 1971, runs through undeveloped land to the interchange with the Intercounty Connector toll road (MD 200) before interchanging with MD 198 just west of Laurel. Passing over the Patuxent River just south of the Rocky Gorge Dam, the route enters Howard County and promptly interchanges with MD 216. North of the MD 216 interchange, the route encounters its first rest area in the state of Maryland, with each carriageway served by its own facility. Continuing northeast, I-95 intersects MD 32 at a modified directional cloverleaf. Within this interchange, I-95 grade-separates, with the northbound carriageway passing over MD 32 and the southbound carriageway passing under MD 32, allowing left exits from both of the latter's carriageways to merge into the left lanes of I-95 without conflict. North of this unusual interchange, I-95 encounters MD 175, the main access route into Columbia, at a less-radical directional cloverleaf interchange. After the MD 175 interchange comes the MD 100 interchange, providing access to Ellicott City, US 29, and Interstate 70 to the west, and the Baltimore-Washington Parkway and Interstate 97 to the east. Just beyond this interchange, I-95 encounters three more of its auxiliary routes within Maryland: Interstate 895, which splits from I-95 within the Patapsco Valley State Park, just south of the Patapsco River (and at which point the road enters southwestern Baltimore County); Interstate 195 and MD 166 near Catonsville, a short spur to Baltimore-Washington International Airport, and Interstate 695 near Halethorpe, the Baltimore Beltway, a full-circle beltway around Baltimore that offers a full freeway bypass of the city and that connects to Interstate 70, Interstate 83, and Interstate 97. Traffic not authorized to make use of either of the direct (tunnel) routes through Baltimore is encouraged to use the eastern half of I-695, which crosses the Patapsco River via the Francis Scott Key Bridge. When this part of I-95 opened to traffic in 1971, all interchanges in the stretch had high-mast lighting, but beginning in 2010, these were replaced with lower-mounted conventional streetlights. However, the MD 200 and southern I-895 interchanges (which opened in 1973 as part of an extension from its original terminus at US 1) now have high-mast lights. South of Baltimore, I-95 is maintained by the Maryland State Highway Administration; north of the southern Baltimore city line, I-95 changes jurisdiction to the Maryland Transportation Authority. Continuing on its northeasterly track, the route intersects US 1 Alt. just beyond the city line. I-95's interchange with US 1 Alt. incorporates stubs and unused embankments that would have been used for the planned eastern terminus of I-70 within Baltimore (later planned as the southern terminus of I-595, though the freeway was later cancelled and that designation was moved to US 50 east of Washington). Continuing past this unbuilt interchange, I-95 intersects Washington Blvd., a local city street (with ramps to the southbound side and from the northbound side), before encountering the main access route into the central business district, Interstate 395. I-95 also interchanges with the northern terminus of the Baltimore-Washington Parkway (and the southern terminus of Russell Street, with ramps to the transitioning roads and from the terminating ones) within the I-395 interchange, which is almost completely elevated over the Middle Branch of the Patapsco River. After interchanging with both routes, I-95 interchanges with MD 2 and Key Highway, the latter route offering access to Fort McHenry and an escape route for hazardous material traffic. I-95 encounters the Fort McHenry Tunnel south of Fort McHenry. The tunnel, containing eight lanes, curves underneath the Northwest Harbor and emerges in the Canton neighborhood of Baltimore, quickly encountering the toll plaza. After the toll plaza, I-95 encounters the Boston St.-O'Donnell St. interchange, which also incorporates stubs and other unused infrastructure planned to be used for the southern terminus of Interstate 83; I-95 also passes over I-895 within the interchange area, with no access between the two routes, then runs into East Baltimore, providing local access to various city streets (a northbound-only exit to Dundalk Avenue and a 3/4 interchange with Eastern Avenue, which share southbound access ramps via Kane Street) in lieu of I-895. It interchanges with the Moravia Road freeway spur next to the Baltimore city line (where ramp stubs were once planned for an unbuilt portion of the Windlass Freeway), then connects with US 40 before narrowing to six lanes and merging with I-895 just after exiting Baltimore into northeastern Baltimore County. From 2009 to 2015, new gray gantries were installed that displayed signs in the Clearview font which was being adopted statewide, replacing the old brown gantries and Highway Gothic signs (some of which had button copy). In 2017, the high-mast poles, which were also brown, were taken down and replaced with new gray ones as well. The John F. Kennedy Memorial Highway portion of I-95, a toll facility operated by the Maryland Transportation Authority (MDTA), begins at the end of the Harbor Tunnel Thruway (I-895) (also operated by MDTA) at the Baltimore city line. Starting out eight lanes wide at the junction with I-895, after three miles (3 km), I-95 once again intersects with Interstate 695 in Rosedale at what was a unique double-crossover interchange. Within this interchange, the carriageways of I-95 narrowed to six lanes and crossed over each other, thereby putting through traffic on the left within the interchange nexus, allowing left exit ramps and left entrance ramps to accommodate four of the eight movements in lieu of flyovers. Beyond the interchange, both sets of carriageways crossed over each other again and resumed right-hand running. As part of the upgrades to Interstate 95 to accommodate express toll lanes in this area, this interchange was replaced with a more conventional four-level stack; all exits are now on the right, and I-95's carriageways no longer cross over one another; a similar project also eliminated the crossovers on I-695. Continuing to the northeast, parallel with the Chesapeake Bay, the route encounters MD 43 near White Marsh. After passing through Gunpowder Falls State Park, and into Harford County, the route interchanges with MD 152 north of Joppatowne, then with MD 24, providing access to Bel Air and Edgewood. Within the MD 24 interchange, I-95 narrows to six lanes and remains this wide to the Delaware border. The "North East Rising Sun" exit off I-95 in northern Maryland has been read by some drivers, including children's writer Katherine Paterson, as referring to a single exotically-named location. Still paralleling the northern shore of the Chesapeake Bay, I-95's carriageways split apart again to encounter another service area, Chesapeake House. Now past the northern tip of the bay, north of Elk Neck State Park, the route encounters MD 272, which provides access to the towns of North East and Rising Sun. Having turned east, the route now runs straight towards the Delaware state line, passing under MD 213 north of Elkton with no access offered, and then reaching the Exit 109 interchange with MD 279, which provides a direct route into Elkton and Newark, Delaware. I-95's run through Maryland comes to an end quickly after that exit, and it crosses the Delaware state line, becomes the Delaware Turnpike, and soon reaches the Newark toll plaza (in 2012, the MdTA installed signs prior to and at the MD 279 interchange informing motorists of the Delaware toll plaza ahead). Similar to what was done on the between the Beltways segment, new lighting projects have replaced the original high-mast lights with conventional streetlights at the MD 152 and MD 155 interchanges, but new high-masts were installed from the Perryville toll plaza to MD 222. Additionally, there are now high-mast lights at the northern I-695 interchange in Rosedale to match its southern counterpart in Halethorpe (although the ones in Halethorpe were removed by 2018); those replaced the conventional streetlights that had existed within the area. I-95 has express toll lanes in the median between the I-895 merge in northern Baltimore to just north of MD 43 in White Marsh, with two express toll lanes in each direction. In addition to access to and from I-95 at both ends, the express toll lanes have a southbound exit and northbound entrance with I-895, a southbound exit and northbound entrance with Moravia Road via I-895, and a northbound exit and southbound entrance with MD 43. The express toll lanes utilize all-electronic tolling; tolls are collected by E-ZPass or Video Tolling, which uses automatic license plate recognition and sends a bill in the mail to the vehicle owner. Video Tolling users pay an additional 50% surcharge on their tolls. The toll rates along the express toll lanes vary by time of day and the day of the week. Peak travel times, which is southbound during weekday mornings, northbound during weekday evenings, and both directions on weekend afternoons, have the highest rates. Off-peak travel times, which occur during the daytime outside of peak travel times, have lower rates, with the overnight hours having the lowest rates. "Maryland House" redirects here. For the legislative body, see Maryland House of Delegates. Maryland House, opened in 1963, is at milepost 81.9 in Harford County. It was later remodeled in 1987, and wing additions were added in 1989-1990. It was closed on September 15, 2012 and demolished for reconstruction, and reopened on January 16, 2014 with Auntie Anne's, Carvel, Currito Burrito, Dunkin' Donuts, Jerry's Subs & Pizza, Nathan's Famous, Phillips Seafood, and Wendy's as the current food offerings. Retail shopping includes Bijoux Terner, Brookstone, Orange Optix, and Sunshine Market. Chesapeake House, opened in 1975 (after the highway was widened from four to six lanes in 1972), is at milepost 97 in Cecil County. It was closed and demolished in January 2014 following the reopening of the Maryland House, and reopened on August 5, 2014, with Auntie Anne's, Earl of Sandwich, KFC, Peet's Coffee & Tea, Pizza Hut Express, and Wendy's as the current food offerings. Retail shopping includes Bijoux Terner, Orange Optix, and Sunshine Market. Howard County rest area is located in Howard County, between Baltimore and Washington, D.C. Unlike the two full service rest areas, which are located in the median, this rest area is located on the shoulders, with separate facilities for each direction of travel. This rest area also features only rest rooms, a tourist information area, and vending machines, in contrast to the full food and fuel options at the two service areas further north. Under the original plans for Interstate 95 in Maryland, the route would not have followed the eastern half of the Capital Beltway from the Woodrow Wilson Bridge to the College Park Interchange. Instead, it would have exited the District at New Hampshire Avenue (MD 650), following the Northeast Freeway, and after passing through Northwest Branch Park, junctioned I-495 at the College Park Interchange, integrating seamlessly with the existing segment of I-95 at that interchange. This route was canceled in 1977, and I-95 rerouted, after the District government canceled the North Central Freeway, which would have linked to the Northeast Freeway at its southern end and carried I-95 deeper into the District, connecting to the Inner Loop. The part of I-95 that was completed from downtown Washington to the Springfield Interchange in Springfield, Virginia, was then re-designated as I-395. Several proposals were made during the 1940s and 1950s for an East–West Expressway through Baltimore. After nine different proposals were floated, the city's Department of Planning published a proposal of its own in 1960. The route in the proposal would have started out as Interstate 70N (as it was known then) and run due east, crossing the city to the north of the Inner Harbor on an elevated viaduct within the central business district (CBD). The route would have met two other freeways—the Jones Falls Expressway and the Southwest Expressway—at a four-way interchange in the southeast edge of the CBD; I-95 would have followed the Southwest Expressway, and met both I-70N and I-83 (on the Jones Falls Expressway) at this interchange. I-70N and I-83 would have terminated at the interchange, while I-95 would have turned east and followed the East–West Expressway out of the CBD, along the Boston Street corridor and out towards East Baltimore, intersecting the Harbor Tunnel Thruway near today's Exit 62. The Southwest Expressway would have cut through Federal Hill and crossed the Inner Harbor on a fixed bridge with 50 feet (15 m) of vertical navigational clearance. All of these proposed routes would have required extensive right-of-way acquisition and clearance. The above routings were eventually further refined and modified and eventually became part of the Baltimore 10-D Interstate System, approved in 1962. In this plan, I-95 would run east–west to the north of Fort McHenry, similarly to the above proposal, but would have run along the southern edge of the CBD, passing to the north of Federal Hill and cutting through the historic Fells Point neighborhood. After crossing the Inner Harbor on another low bridge, it would have followed the Boston Street corridor, crossing the Harbor Tunnel Thruway near to where it does today, then followed the existing I-95 alignment out of the city. The highway would have junctioned Interstate 70N a mile to the northwest of the Inner Harbor, near the eastern terminus of the now-defunct Interstate 170; it would have met Interstate 83 in the northeastern corner of the central business district. This routing was little different from the routings proposed in 1960, and was also universally disliked. 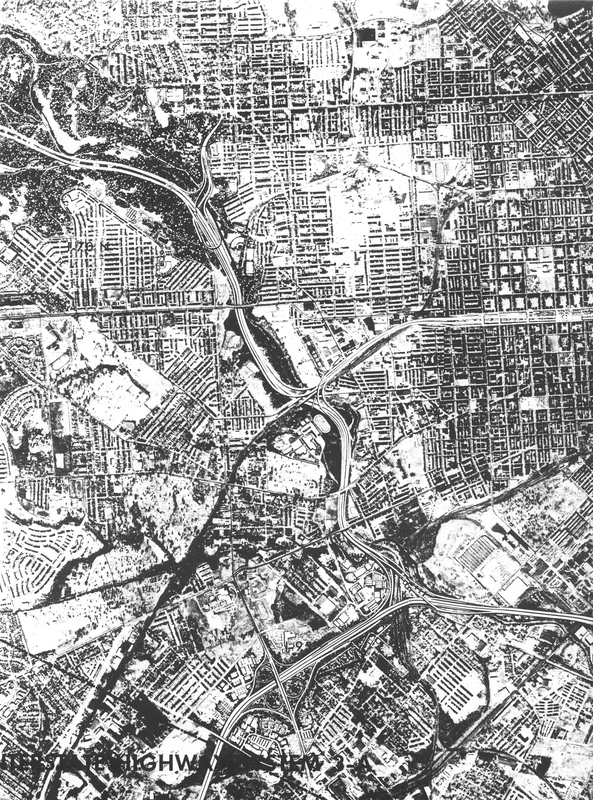 By 1969, the Design Concept Team, a multi-discipline group assembled in 1966 by the city government to help design freeway routings that would not disrupt the city's fabric, the 10-D System had been replaced by the Baltimore 3-A Interstate and Boulevard System. In the 3-A system, I-95 was shifted south onto the Locust Point peninsula, and eventually constructed there. I-70N would have run through Leakin Park and Gwynns Falls Park to terminate at I-95 near Alt US 1, while I-83 was shifted to a new alignment and planned to terminate at I-95 north of the Patapsco River. Interstate 395 was also brought into existence under this plan; it was planned as a freeway spur from I-95 to the south edge of the central business district, connecting to a new route named City Boulevard (now known as Martin Luther King Jr. Boulevard). The 3-A System's result was that I-95 would act as a bypass of the central business district, with I-395 providing direct access. The first portion of I-95 in Baltimore was the southern 0.6 miles (0.97 km) of the John F. Kennedy Memorial Highway, completed in 1963. By 1971, I-95 had entered Baltimore proper when it was completed between the Capital Beltway and the Baltimore Beltway; beyond the southern I-695 interchange, the highway came to a dead halt at Alt US 1. By 1974, I-95 was under construction in East Baltimore between its current merge with I-895 south to a partial-cloverleaf interchange with MD 150 Eastern Avenue. By 1976, I-95 was under construction east of Alt US 1 and south of MD 150. By 1981, I-95 was completed as far as I-395, and by 1984, with the construction of the Fort McHenry Tunnel quite advanced, the route was open as far as MD 2 west of the Patapsco, and Boston St.-O'Donnell St. east of the Patapsco. With the final opening of the tunnel on November 23, 1985, I-95 was finally completed within the city of Baltimore. Originally, the toll plaza at the north end of the Fort McHenry Tunnel was to be removed after the city of Baltimore repaid its share of the construction costs of the tunnel. However, the Maryland Transportation Authority lobbied successfully to keep the toll plaza in place to prevent a traffic problem on I-95 within Baltimore. Completed in 1963, the 48 mile Northeastern Expressway and the adjoining 11 mile Delaware Turnpike were dedicated by President John F. Kennedy on Thursday, November 14, 1963, at a ceremony at the Mason–Dixon line. In 1964, the highway was renamed the John F. Kennedy Memorial Highway after his assassination in Dallas, Texas, on November 22, 1963, eight days after President Kennedy was on hand for the opening of the two highways. Between 1963 and 1993, the John F. Kennedy Memorial Highway was a tolled facility for the entire length of the roadway in both directions. The mainline toll plaza is situated just north of the Tydings Bridge in Perryville. The southbound toll plaza was removed in 1991, but tolls are still collected for northbound traffic over the Tydings Bridge at this location. Additionally, ramp tolls were collected at many of the interchanges until they were abolished by an act of the legislature in 1981. The highway and bridge are maintained by the MdTA. To allow a seamless connection between the John F. Kennedy Memorial Highway and the then-unnumbered Harbor Tunnel Thruway, a partial interchange was constructed for I-95 to continue south into Baltimore City. However, this meant that I-95 had to enter from and exit to the right, as evidenced by a southbound flyover ramp; a construction project corrected the problem in 2009 so that I-95 would proceed straight through the interchange. Express toll lanes were built from the I-895 merge in northern Baltimore to just north of MD 43. The ETLs opened Saturday, December 6, 2014, after more than 8 years of construction. Construction of the I-95 ETLs was part of the $1.1 billion I-95 Improvement Project, which included $756 million in highway and safety improvements along eight miles of I-95 from the I-895 interchange to just north of White Marsh Boulevard (MD 43) in northeast Baltimore. Originally, there were several changes in jurisdiction over maintenance of Baltimore's segment of I-95. North of the Baltimore city line as far as Exit 55 (Key Highway), the route was maintained by the city of Baltimore. Between Exit 55 and Exit 57 (Boston Street/O'Donnell Street) the route, traversing the Fort McHenry Tunnel, was maintained by the Maryland Transportation Authority. Between Exit 57 and the Baltimore city line the route was again maintained by the city of Baltimore. Now, between the southern Baltimore city line (near Exit 49, the southern I-695 interchange) and the northern Baltimore city line, the route is maintained entirely by the Maryland Transportation Authority. Maryland state highway police force and the authority's own police force share police duties on this segment. Additionally, the city of Baltimore pays the MdTA to maintain I-95 within the city limits. I-95 has at least four incomplete interchanges along its route, with three located within the city of Baltimore. Traveling northbound, the first interchange encountered is the College Park Interchange, exit 27. This was the intended site of the northern crossing of I-95 and I-495 and the northern end of the Northeast Freeway. South of here, I-95 was to enter the District on the Northeast Freeway, continue on the North Central Freeway and connect seamlessly to the portion of I-95 in downtown Washington that had been completed from there to the Springfield Interchange in Virginia. 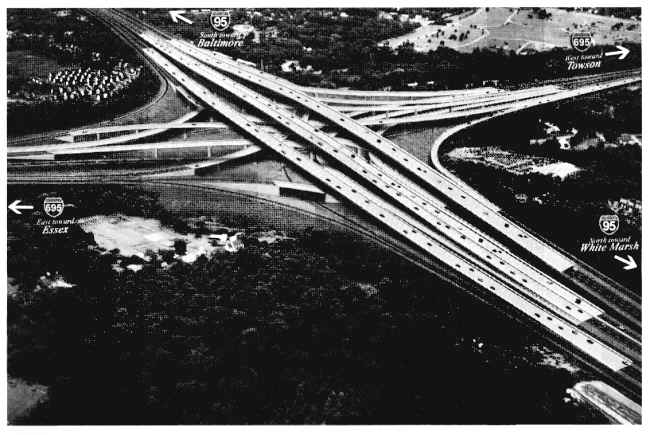 While the College Park interchange was completed, the Northeast Freeway was never built, resulting in highway lanes coming to an abrupt end on the south end of the interchange. After the project to complete I-95 through the District of Columbia was canceled, I-95 was rerouted onto the Capital Beltway in 1977. The portion of I-95 inside the beltway in Northern Virginia and the District of Columbia was designated as Interstate 395. The eastern half of the Capital Beltway was renumbered from I-495 to I-95. In 1991, the I-495 designation was restored on the eastern half of the beltway, numbered concurrently with I-95 as part of an effort to provide more consistent numbering and directional indicators on the Capital Beltway. The College Park interchange was modified in late 1986 to allow free movement along the transition from the I-95 corridor and the Capital Beltway without requiring the use of exit ramps. Today, all parts of the interchange are in regular use. The southern end of the interchange now serves as a Park and Ride commuter lot. 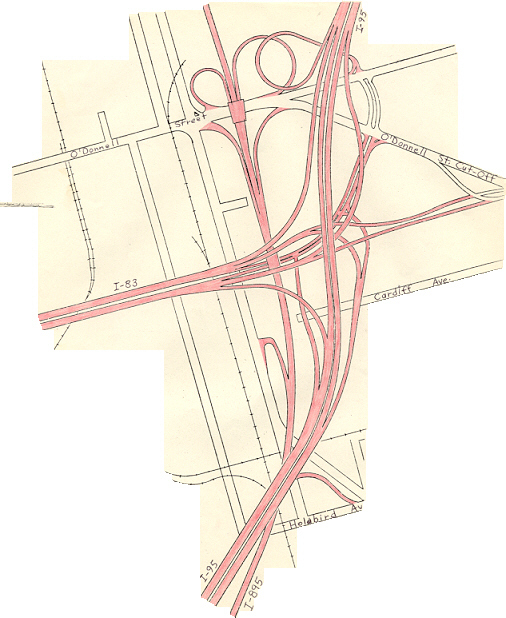 The other three interchanges are located in the city of Baltimore, a sign of the many successful freeway revolts that accompanied the construction of the 3-A System: the planned eastern terminus of Interstate 70; the planned southern terminus of Interstate 83; and the planned southern terminus of the Windlass Freeway. All three unbuilt interchanges incorporate interchanges with local roads. The first is located near Exit 50 in Baltimore; it is the site of the planned eastern terminus of Interstate 70 within the city. The only remnants of the interchange that remain in situ today are the mainline bridges built to grade-separate I-95 and the exit ramps to and from I-70, several ramp stubs, and a few grassy abutments. An incomplete flyover bridge once existed as well, but was later demolished. While this interchange was left incomplete, the existing Exit 50, built with extensive collector-distributor lanes due to its proximity to the unbuilt interchange, stands as a more visible sign of what was planned. Today, Exit 50 connects Alt US 1 to I-95. The second is located near Exit 57, just to the north of the Fort McHenry Tunnel, and is the site of the planned southern terminus of Interstate 83. Like I-70's terminus, the remnants here consist mainly of ramp stubs and unused bridges. This interchange, like Exit 50, also serves Boston Street and O'Donnell Street; unlike Exit 50, I-95 narrows to six lanes within the interchange, as most traffic was expected to diverge onto I-83 north and thus into the downtown area. The interchange would have been a 3-way freeway-to-freeway interchange, with a full complement of ramps provided for local access to and from Boston Street and O'Donnell Street, to and from both Interstates. Of the two planned Interstate termini, I-83's terminus was the first to be abandoned, with the connecting highway segment being cancelled in September 1982; I-70's terminus, later redesignated as a new route, was cancelled in July 1983. The third is encountered at Exit 60 and is the site of the southwestern terminus of the Windlass Freeway, a relief route for US 40 (part of the route was eventually built and is today part of I-695). The interchange that exists at this site is in partial use, serving the Moravia Road freeway spur; like the other two inner-city locations, ramp stubs mark the site of the ramps to and from the unbuilt freeway. On January 13, 2004, a tanker truck carrying flammable liquid fell off of the southbound ramp from the Harbor Tunnel Thruway to I-95, landing on the travel lanes and causing a massive explosion, crushing several vehicles and killing four. Despite this, no damage was done to either highway and both were reopened early in the morning on January 14, 2004. On October 16, 2004, a sudden hail storm just north of Baltimore caused a string of 33 accidents, involving at least 130 vehicles, in an 11-mile (18 km) stretch of I-95. Both northbound and southbound lanes were closed down. The northbound lanes were reopened seven hours later, and the southbound lanes required a further 12 hours to clean. On January 16, 2007, an exhausted truck driver lost control of his tanker truck, causing it to overturn on the northbound carriageway near Maryland House in Harford County. The route was closed for a time when leaks were discovered in the tank, which was carrying a corrosive alkaline material; the outermost right lane remained closed until 3:00 pm that day. On October 4, 2008, at around 2:00 am, a tanker carrying acetone overturned on the southbound lanes south of exit 85, closing down both the northbound and southbound lanes for over eight hours. According to State Police, the tanker leaked acetone and other flammable liquids after overturning. Four others were also involved in the crash and were taken to the University of Maryland Shock Trauma Center in Baltimore. Both the northbound and southbound lanes reopened at around 11:00 am on the same day. Section 100 is an eight-mile (13 km) segment of the JFK Highway that runs between Exit 62 (Interstate 895) and milepost 70. This segment used to be just eight lanes wide (a 4–4 configuration) and carries approximately 165,000 vehicles per day (expected to increase to 225,000 vehicles per day by 2025). This segment has been expanded to twelve lanes (a 4-2-2-4 configuration), with the center lanes designated as express toll lanes. In addition, the interchange between the JFK Highway and the Baltimore Beltway at Exit 64 has been rebuilt into a more orthodox stack interchange, removing the left entrances and exits as well as the unique carriageway crossovers on I-95 (the carriageway crossovers on I-695 there remained, but those have since been removed as well). The interchange at Exit 67 (MD 43) has been significantly modified from its former cloverleaf configuration, and the interchange at Exit 62 was also reconfigured so that I-95 is now the straight-ahead route instead of I-895, thus eliminating the need for southbound I-95 traffic to weave to the right and cross over. The project cost $1.1 billion. It began in 2006 and was completed in 2014. Section 200 is a 15-mile (24 km) segment from milepost 70 to Exit 85 (MD 22). This segment is also currently eight lanes wide (a 4–4 configuration) as far as Exit 77 (MD 24), and is currently six lanes wide (a 3–3 configuration) between Exit 77 and Exit 85. Like Section 100, this segment will likely be widened into a 4-2-2-4 configuration as far as Exit 80 (MD 543). Between Exit 80 and Exit 85, the remainder will likely be widened from a 3–3 configuration to a 4–4 configuration. While the MdTA has not yet finalized plans for this segment, the MD 24 interchange was improved, with the interchange improvement project completed in 2009. Section 400, the longest segment, is 30 miles (48 km) long and stretches from Exit 80 to the Delaware border. This segment is six lanes wide (a 3–3 configuration) and is likely to be widened into a 4–4 configuration. This segment will require major reconstruction of the Millard E. Tydings Memorial Bridge. A study is currently underway to consider adding a new lane on each side between I-495 and I-695. This would be done by constructing new inner shoulders on the median and converting the existing inner shoulders to high occupancy vehicle lanes that would be open to vehicles with three or more occupants, hybrid and electric vehicles, emergency vehicles, and other official government vehicles. The MdTA, at the request of an assortment of elected officials, completed a study which examined a relocation of the northbound toll barrier, which is currently just north of the Tydings Bridge crossing of the Susquehanna River at Perryville. The study concluded the barrier should remain where it is, because "relocating the toll plaza from the current location would result in significant diversion from I-95 onto local Cecil County roads" and "the closer the toll plaza goes to Delaware the greater the diversion there is to local roads, the greater the revenue loss to the state toll operator MdTA, and the more travel there is on slower, less safe surface arterials." MD 200 Toll (Intercounty Connector) to US 29 / I-270 / US 1 / Konterra Drive (MD 206) Split into exits 31A (east) and 31B (west); Konterra Drive (Exit 32). Muirkirk MARC Station accessed via exit 31A. E-ZPass or Video Tolling on MD 200. ^ "Route Log- Main Routes of the Eisenhower National System of Interstate and Defense Highways: Table 1". Federal Highway Administration. Retrieved October 4, 2014. ^ Smedman, M. Sarah; Chaston, Joel (2003). Bridges For the Young: The Fiction of Katherine Paterson. Scarecrow Press. p. 63. ISBN 0-8108-4499-0. ^ a b "I-95 Express Toll Lanes". Maryland Transportation Authority. Retrieved September 21, 2017. ^ "I-95 Express Toll Lanes Map" (PDF). Maryland Transportation Authority. Retrieved September 21, 2017. ^ "I-95 Express Toll Lanes Brochure" (PDF). Maryland Transportation Authority. Retrieved September 21, 2017. ^ "Maryland I-95 Travel Plazas". Maryland Transportation Authority. Retrieved July 11, 2017. ^ "MARYLAND HOUSE ON I-95 CLOSES FOR RECONSTRUCTION AT MIDNIGHT, SEPT. 15; CHESAPEAKE HOUSE OPEN FOR BUSINESS" (PDF) (Press release). Maryland Transportation Authority. September 6, 2012. Retrieved September 9, 2012. ^ a b c "I-95 MD Travel Plazas". Maryland Transportation Authority. September 8, 2014. Retrieved October 4, 2014. ^ "Maryland House on I-95 to close Sept. 15 for reconstruction". ExploreHarford.Com. September 6, 2012. Retrieved September 10, 2012. ^ "Maryland House set to open by midnight Thursday". Baltimore Sun. January 16, 2014. Retrieved January 20, 2010. ^ "MDTA Announces Public-Private Partnership to Redevelop & Operate I-95 Travel Plazas". Maryland Transportation Authority (MDTA). Retrieved August 5, 2014. ^ a b c Kozel, Scott. Roads to the Future: Baltimore Early Expressway Planning URL accessed 17:55, February 5, 2007. ^ "Fort McHenry Tunnel". Roads to the Future. Retrieved February 16, 2019. ^ Rector, Kevin (November 17, 2014). "Express toll lanes on I-95 north of Baltimore set to open Dec. 6". The Baltimore Sun. Retrieved September 21, 2017. ^ a b Kozel, Scott. misc.transport.road: Re: Road trip report: New York, NY to Baltimore, MD/Washington, DC and back URL accessed 13:04, February 4, 2007. ^ Feaver, Douglas (July 23, 1977). "Interstate Numbers To Change". The Washington Post. p. E1. ^ "Report of the Special Committee on US Route Numbering to the Executive Committee June 10, 1991" (PDF). AASHTO Special Committee on US Route Numbering. AASHTO. Retrieved August 27, 2018. ^ Kozel, Scott. misc.transport.road: Baltimore Interstate Highway Cancellation Details URL accessed 12:57, February 4, 2007. ^ Kozel, Scott. Four Killed in Fiery I-95 Crash URL accessed 13:42, January 26, 2007. ^ Lansford, John. I-95 reopens after fiery crash URL accessed 13:46, January 26, 2007. ^ Baltimore Sun. I-95 reopens nearly 15 hours after tanker truck overturns URL accessed 13:22, January 26, 2007. ^ a b c "Maryland State Police". Mdsp.org. October 4, 2008. Retrieved September 19, 2011. ^ "I-95/695 Interchange". Retrieved January 29, 2013. ^ "I-95 / JFK Toll Plaza Planning Study: Introduction" (PDF). Maryland Transportation Authority. Fall 2010. pp. p. 1. Retrieved January 11, 2011. ^ "I-95 / JFK Toll Plaza Planning Study: Recommendations" (PDF). Maryland Transportation Authority. Fall 2010. pp. p. 1. Retrieved January 11, 2011. ^ Samuel, Peter (January 10, 2011). "MD/I-95 toll upgrade near present plaza: ORT + 7/8 lanes or AET proposed". TOLLROADSnews. Retrieved January 11, 2011. ^ Highway Information Services Division (December 31, 2013). Highway Location Reference. Maryland State Highway Administration. Retrieved September 9, 2012. ^ Highway Information Services Division (December 31, 2005). Highway Location Reference. Maryland State Highway Administration. Retrieved September 9, 2012. ^ The Woodrow Wilson Bridge crosses through the District of Columbia for approximately 300 feet (91 m). Wikimedia Commons has media related to Interstate 95 in Maryland. This page was last edited on 23 April 2019, at 00:29 (UTC).